«Alpamysh» is nation heroic epic in the Turk people. This epic tale about the hero Alpamysh and his exploits, formed in 14-17 centuries, when the people of Central Asia waged a struggle against Jungar rulers. The most extensive version of the legends of the Uzbek Alpamysh is recorded by Fazil Juldash-ogly. Compositionally epic is divided into two parts: 1) Alpamysh’s trip to the bride, marriahe of heroes; 2) Alpamysh’s campaign against Kalmyk ruler Taychahan, his seven-year stay in prison and victorious return to his homeland. The main ideas of the epic are struggle of the people for independence, the highest human ideals and peaceful life. The first part of "Alpamysh" was published in Russian translation edited by the poet Hamid Alimjan in 1939 in Tashkent. The plot of the epic is close to mythology of the ancient Turkic and Mongolian people. So, in the Altai tale "Alyp-Manash" the hero is endowed with shaman features. 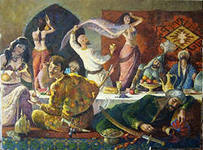 Heroic poem "Alpamysh" is one of the favorite and widespread epic works of the Uzbek people. In the richest treasury of folk art it takes the same prominence and honor place as "Knight in the Panther's Skin", "Manas", "Kalevala" and other famous epics.